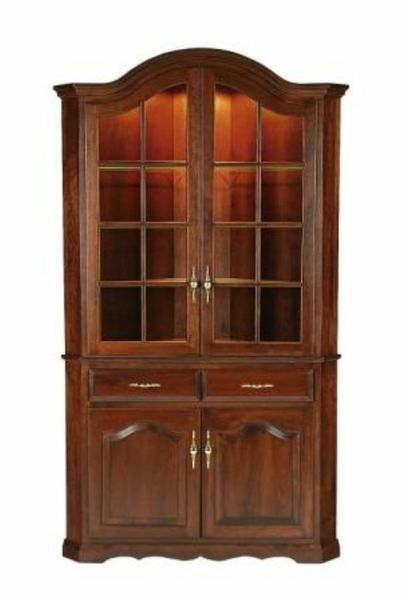 The Queen Anne style Corner Hutch is pure elegance for the formal dining room. You can choose between a 28" or 32" hutch cabinet, depending on your wall space. This corner hutch, like all of our Amish furniture, is 100% solid wood in the USA. The hutch has two cabinet doors on the top, each with a handsome brass pull for a classic accent and ease of pulling. Each cabinet door also has eight glass panes for easy viewing of the contents. The hutch top is finished with beautiful crown moulding. This hutch has hidden hinges and full extension drawer slides. In addition, glass shelves, touch lighting and mirror backs are available. The base of the hutch cabinet has one drawer and two doors at the bottom. The bottom doors have a decorative engraved inset. DutchCrafters offers a wide variety of Amish handcrafted Queen Anne furniture. Call one of our sales associates today with questions or ordering assistance. You can also visit us at our Amish furniture store in Florida. The hutch top is delivered with blocks (that are stained with the hutch) on the bottom of each side to protect it during shipping. Take slight pressure to them with a screwdriver to pop them off before setting the hutch top on the buffet. Staff,Melanie in particular was very attentive and pleasant to work with. Corner Hutch is exactly what I wanted. Quality of item is top notch.